Sharing healthy recipes and tips so you can start eating to LIVE not living to eat! This is a great recipe packed with nutrient dense ingredients. You will be pleasantly surprised with this one! Whisk together anchovies, lemon zest and juice, and oil in a bowl. Season with salt and red pepper flakes. Add kale and toss to combine. Massage the oil mixture into the kale for about 3 minutes. Press egg through a fine sieve into a separate bowl. 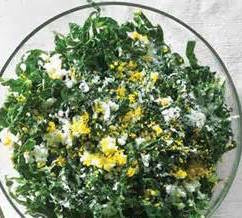 Mix into kale or sprinkle on top before serving. 3 – TrueFare – Order Premade Meals – save 10% using "westcobbchiropractic"